options among Houston school districts. There are 18 school districts within the Houston area, and where you live dictates the school your children attend. As the largest in the state and seventh-largest in the country, Houston Independent School District consists of 284 schools attended by 215,000 students. Houston is a large and diverse city, and HISD’s student population reflects that diversity. The students come from a range of cultural and ethnic backgrounds and speak over 100 different languages. Dual-language instruction is available in 56 HISD schools. Houston ISD boasts the lowest property tax rate of any Harris County school districts, has a 77.9% graduation rate (as of 2016, up 21% from 2007), and saw $388.4 million in scholarships awarded to its students in 2017. HISD’s After School Programs provide academic support, such as tutoring and homework assistance, as well as enrichment programs. These include performing arts, karate, photography, fitness, and cosmetology. With Houston ISD’s emphasis on providing students with a well-rounded education, your child will have every opportunity to excel in academics, as well as build social and practical life skills. Step One: Take the Career Interest Survey to find an industry that interests you. Step Two: Use the Texas Reality Check to formulate monthly expenses and determine salary needs. Step Three: Plan Your Path with the Career and Technical Education Programs of Study guide. There are 16 CTE programs of study and pathways, including Agriculture, Business Management and Administration, Education, Manufacturing, STEM, and Information Technology. Students taking dual credit CTE courses can earn associate degrees, baccalaureate degrees, licensures, and more. Click here to check out the Career and Technical Education Programs of Study guide. This guide details which HISD schools offer pathways relevant to the student’s interests and lists career options within each industry, as well as available certifications and licensures. Teach Forward Houston is a fellowship offered in partnership between HISD and the University of Houston, offering students $20,000 to put toward tuition for a Bachelor of Science in Teaching and Learning at U of H. Fellows then give back to the community by teaching in an HISD classroom for a minimum of four years upon graduation. Additional supports for TFH Fellows include summer internship opportunities, prioritized hiring support, mentoring, and specialized professional development opportunities. HISD provides parents with children ages 0 to 6 a free subscription to ReadyRosie, an interactive tool designed to prepare children for school. Short weekly activity videos are sent to parents’ phones, tablets, or computers, so you can watch and model them from anywhere. ReadyRosie encourages discussion about respective weights of objects, counting, measuring length and width, and other critical thinking skills vital to early education. How Do I Know Which Schools My Child Will Attend? 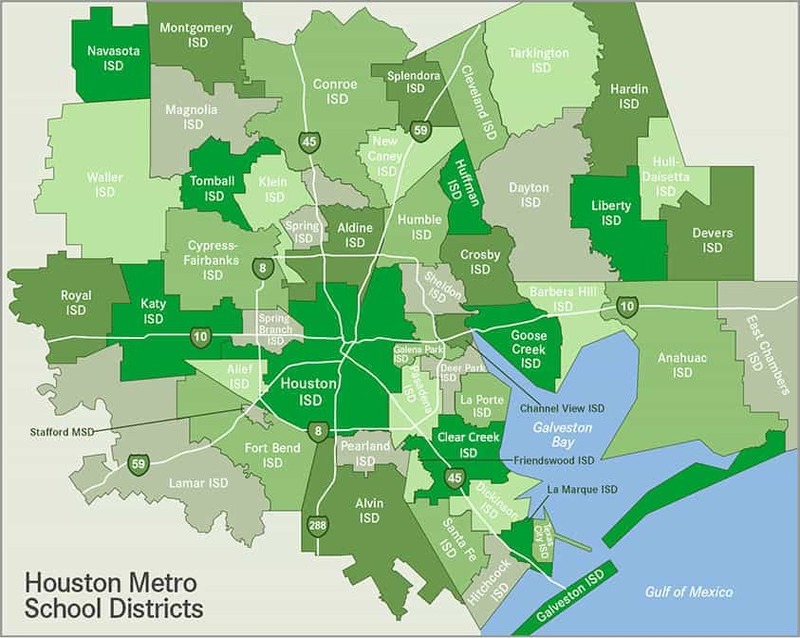 There are 18 school districts within the Houston area, and the schools your children will attend are determined by your neighborhood. Visit HISD’s school search page to locate campuses that serve your area. Use this resource to help you figure out which school distrct your children will be a part of. We love Houston, and we hope you will, too! If you’re considering a move to Houston, Ameritex can help. Call us today at 713.484.6683 to ask about our Stress-Free Move guarantee and get started on your complimentary moving quote. Want to learn more about living in Houston? Click here for more Houston-area resources and information.